Heart disease is the number one killer of women in the United States. Hearten is an application designed for women to prevent and reverse heart disease. Hearten helps you fight heart disease by improving lifestyle choices through community support and personalized goals. To increase accountability, the application connects doctors and users by sending doctors summaries of their patients progress. Drove initial market research and conducted usability testing to validate our design concepts. Interview a local naturopath to inform our strategies for improving the doctor and patient relationship. Created the UI design to reflect our user's needs and motivate them to accomplish their health goals. Heart disease is a condition characterized by narrow or blocked blood valves. This condition can lead to heart attack, chest pain, or stroke. 90 percent of women have one or more risk factors for developing heart disease. Risk factors include smoking, diabetes, high cholesterol, inactivity, obesity, and high blood pressure. Despite increased awareness, only 54 percent of women recognize that heart disease is their number one killer. Since heart disease is avoidable, how might we develop a system that utilizes community to prevent or reverse heart disease through specific and personalized goals? To further understand our problem space, we interviewed a local Naturopath, Dr. Fresonke. Dr. Fresonke treats women with heart disease and consults women at risk of developing the condition. In our interview, we learned that Dr. Fresonke primarily uses flyers to educate her patients. She suggests more frequent visits for her patients that have heart disease. Dr. Fresonke shared with us lifestyle improvements are crucial to preventing and fighting heart disease. She affirmed that positive encouragement was the best strategy to assist women in making these types of changes. In addition, we found multiple studies that show goals are easier to reach if they're specific and rooted in positive thinking. The addition of social support can increase the implementation of goals by 78 percent. The storyboards helped us to further understand our user and problem space. The storyboard below represents the journey of a woman at the doctor's office. She is coming in for her monthly check in as she is actively fighting heart disease. During her visit, the doctor suggests that she try the Hearten app. The woman downloads and explores the app. As a result of using the app, she is able to make positive changes to her lifestyle choices. We see her trying yoga for the first time and loving it! Usability testing helped us to improve and streamline our application. We used these findings to inform our design choices with our application. We tested our application with five women between the ages of 35 -55. 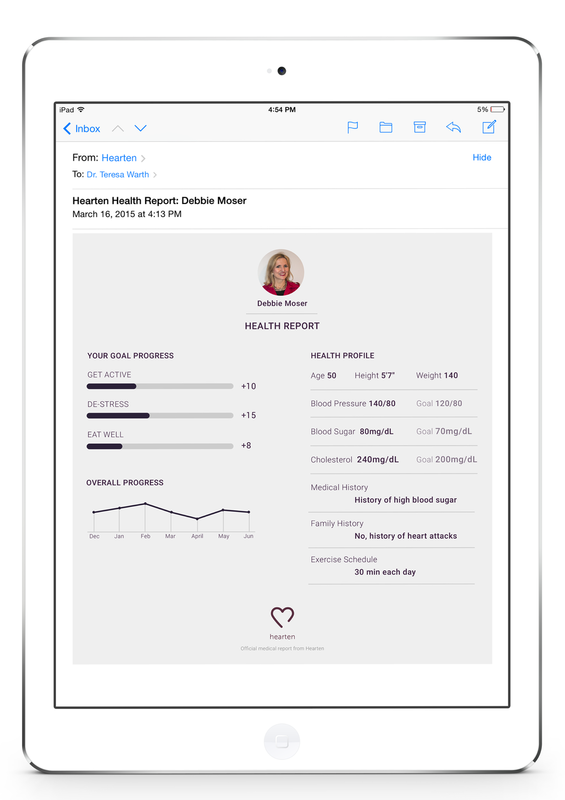 Hearten provides a health report to help doctors deliver detailed and personalized suggestions for their patients. The Hearten health report allows doctors to see their patient's Hearten activity and their health history since they started using the application.